This is my first competition of 2016! As many of my readers know, I simply adore Yankee Candles and I often blog about them over here on my blog. This Christmas I was thrilled when I won their Yankee Candle Bloggers Competition. I stayed up hours trying to develop an idea in the hope that Yankee Candle lovers would enjoy my picture. I thought I would supply a prize today, which is a little different from what I normally give away. 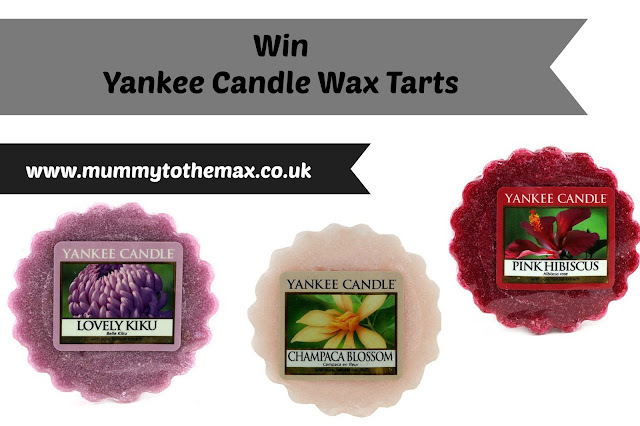 Today's prize is 3 Yankee Candle Wax Tarts. The 3 wax tarts which I am supplying as a prize are: Lovely Kiku, Champaca Blossom and Pink Hibiscus. Having recently tried lots of the Yankee Candle wax melts these are a few of my favourites. To enter this competition all you simply need to do is enter the rafflecopter below. Please note there are daily tasks you can complete to enter this competition every day! If this competition goes well, I am more than happy to keep supplying these types of giveaways! To enter my Yankee Candle competition, please enter the competition below! Good Luck! I love these! I got my daughter a Yankee Candle burner and some of the wax melts and the scents are delicious. They're excellent if you really want to mask smells (I'm looking at my dog here!). They offer great value too. Thanks for the competition! Who doesn’t love a yankee candle?! They look like they’d make amazing spring scents! I love candles and have them lit around the house in the evening. I love some of the Yankee candle scents. I love Yankee Candles! I work at a little concession in my local garden centre. They have a Yankee Candle concession too and I have to walk past it to get to work. It smells so good and I want to buy all of them! I love Yankee candles a lot. They smell amazing. Yankee Candles are my favourite, I have so many of the different scents that I love, that it's always difficult to choose. I haven't tried any of these scented ones before, but will definitely give them a go next time! I love yankee candles and would love to try the melts! This is a luxury for me at the min as I can't afford them. It would be lovely to win so my home smells wonderful and not of wet dog!